Having spawned the legendary Alice in Wonderland, Bilbo and Frodo Baggins and the Chronicles of Narnia, Oxford is not only England's oldest centre for learning, but the home and inspiration of such famous authors as Lewis Carroll, CS Lewis, and JRR Tolkien. In recent years, the city added to its literary resume by acting as the location for several parts of Hogwarts School in the blockbuster Harry Potter films. The 'dreaming spires' of Oxford University house the famous Ashmolean Museum and the Museum of Modern Art; other excellent museums in Oxford include the Pitt Rivers Museum of Anthropology and Ethnology, the Christ Church Picture Gallery, and the Oxford Museum of Natural History. Whether lazing on one of the college quadrangles, punting down the river, pub crawling, or exploring the city's ancient heritage, Oxford promises something for visitors of all ages. 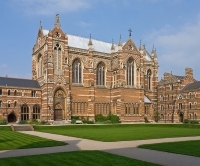 Outside of the university, the city of Oxford has a number of its own attractions, including active theatre and art communities, and many unique and interesting shops and restaurants. The Covered Market in High Street is one of the oldest in England and worth a browse, and you'll find many shops that sell Oxford University memorabilia, whether authentic or not. It should come as no surprise that a town this dedicated to its university would have a busy nightlife, and many bars, pubs and nightclubs open their doors nightly to students and anyone else who wanders in. We are looking for contributors for our Oxford travel guide. If you are a local, a regular traveller to Oxford or a travel professional with time to contribute and answer occasional forum questions, please contact us.